If your doctor has told you that your prostate is enlarged you're likely worried. What are the causes of an enlarged prostate? What symptoms might you expect to have with these different causes? Learn more about this condition and the tests that your doctor may perform to find the answer. An enlarged prostate is a common problem among older men. Because urine travels in a small tube (the urethra) that runs through the prostate as it makes its way out of the body, urinary and bladder control problems are the most common symptoms that men experience. The symptoms include having to urinate frequently. You may feel you need to rush to the bathroom. But then when you are there, you only urinate a little and may have a weak stream. You may also continue to leak or dribble when you have stopped urinating. While these symptoms are common, it is important to make an appointment with your doctor to see what is causing them and get treatment. BPH is a benign (non-cancerous) enlargement of the prostate that is extremely common in older men. Fifty percent of men in their 50s and 90 percent of men over age 80 have BPH. In fact, benign prostatic hypertrophy is such as common cause that it often is simply referred to as an "enlarged prostate," The word hypertrophy means enlarged, and benign means that it isn't due to cancer. It is generally thought to be caused by years of exposure to male hormones like testosterone. While BPH is benign and cannot spread to other parts of the body, it can cause problems. If the prostate enlarges enough, the flow of urine out of the body can be obstructed. If this obstruction is severe enough, it can result in kidney damage. 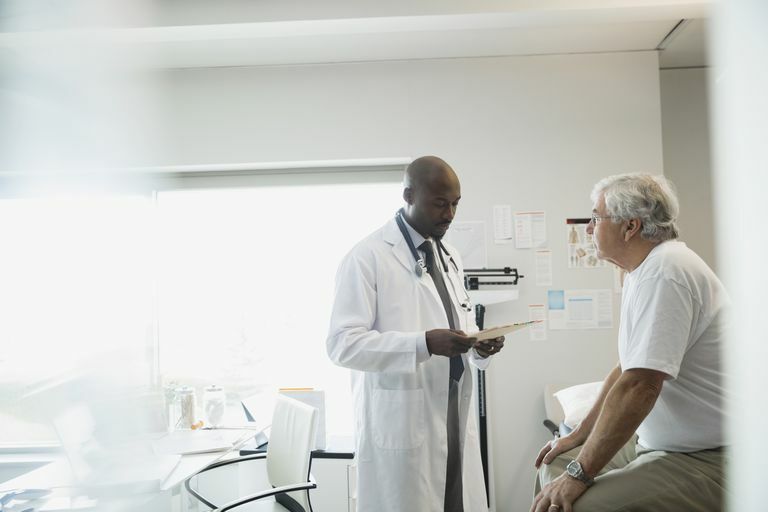 Because the symptoms of BPH and prostate cancer are so similar, your doctor will need to perform more tests and procedures to rule out prostate cancer. Additional tests may include urodynamic tests, transrectal ultrasound, prostate biopsy, cystoscopy, blood tests, and urinalysis. Usually, medication can be given to reduce prostate swelling so that urine may flow more freely. If medication does not work and the obstruction is severe enough, surgery may be required to relieve the obstruction. Prostate cancer can also result in an enlarged prostate, though it less common than BPH. Since the symptoms of BPH and the symptoms of prostate cancer are very similar, however, it can be difficult determining the cause based on symptoms alone. More testing will be done, including blood tests, urinalysis, urodynamic tests, prostate biopsy, or cystoscopy. Prostate cancer can often be diagnosed early and treated successfully. Often, treating a man's prostate cancer results in significant improvement of his urinary symptoms because the prostate is either removed or decreased in size. Prostatitis is a term that refers to inflammation of the prostate from any cause. This may be due to an infection, or instead, results from any kind of inflammation of the prostate. When the prostate is inflamed, it often swells temporarily and can cause obstruction of urine. Like prostate cancer, the treatment of prostatitis often results in a significant improvement in a man's urinary symptoms, and this improvement can occur fairly rapidly with treatment. Prostatitis due to infection can be treated with antibiotics and prostatitis due to most other reasons will typically disappear relatively quickly. As prostatitis improves, the prostatic enlargement will also improve. Urinary problems can be embarrassing. But if you make the appointment to discuss them with your doctor and get tested, you may be able to have them treated. It's important to rule out or diagnose prostate cancer and urinary blockages as early as possible. Knowing the cause of your symptoms is the first step towards resolving the problem. Kumar V, Abbas A, Fausto N. Robbins Pathologic Basis of Disease 9th Edition. 2015. Prostatic Enlargement (Benign Prostatic Hyperplasia). National Institute of Diabetes and Digestive and Kidney Diseases. Prostatitis: Inflammation of the Prostate. National Institute of Diabetes and Digestive and Kidney Diseases. Prostate Problems. National Institute of Diabetes and Digestive and Kidney Diseases.